Thanks to specialty residential contractor Innovative Construction & Roofing, a stately turn of the century home has a beautiful new roof. Situated in Benton Park, a historic St. Louis neighborhood, the roof features a Vermont scallop shaped slate roof. 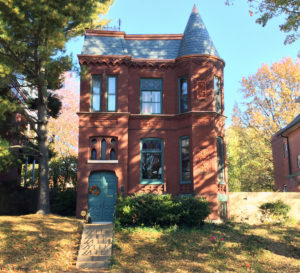 Built in 1886, a beautiful new scalloped slate roof adorns this home in a historic St. Louis, Missouri neighborhood. Established in 1866, the Benton Park neighborhood boasts some of the oldest buildings in the city. Most of the homes, built between the mid-19th to early 20th century, and the architecture of this neighborhood owe much to the imagination and skills of its German masons. Today, Benton Park maintains much of its European character. Therefore, choosing visually appropriate roofing products was key to the project’s success. A dark clear gray Vermont scalloped slate was chosen for its extended life expectancy and historically appropriate look. Each piece of slate on the turret was hand cut in order to hug the round shape. In addition, Innovative replaced the existing galvanized steel gutters with custom copper gutters and detailing, adding to the home’s curb appeal. Beginning work in October 2016, Innovative Construction & Roofing crews tackled the high mansard roof using a motorized lift. The job was completed in November to rave reviews from the property owner. For more information, visit https://innovativeroofs.com.